Prince Livio Odescalchi, and thence by descent. with Galerie Gerda Bassenge, Berlin, 1974, no. B37. M. Kitson, Salvator Rosa, exhib. cat., London, Art Council, 1973, under no. 73. M. Rotili, Salvatore Rosa Incisore, Naples, 1974, under no. 106. R. Wallace, The Etchings of Salvator Rosa, Princeton, 1979, under no. 115j. Connected by Mahoney to Rosa's etching of the Fall of the Giants dated 1663. Often described as a tour de force, the intricate composition was built up from an arrangement of single figure studies such as the present one, re-used by the artist and developed into the large cartoon now at the British Museum. 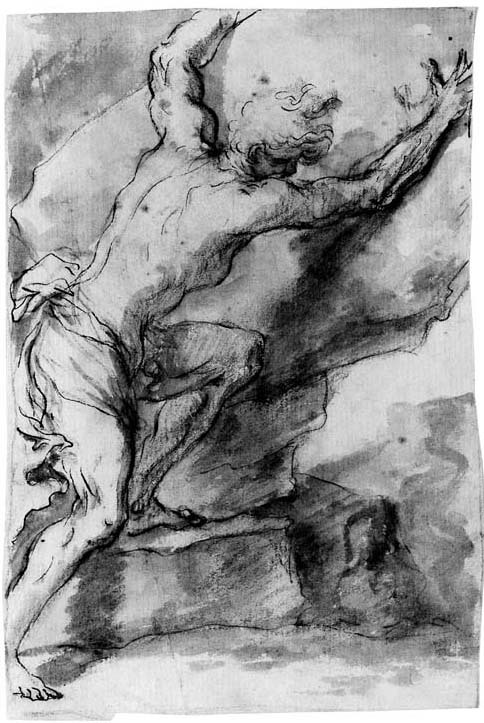 The present figure also appears in reverse and at a different angle in a red chalk drawing in the Gabinetto Nazionale in Rome which the artist discarded at a later stage, I.J. Scott, Salvator Rosa, his life and times, London, 1995, pl. 174.